Efficient software to Export Outlook to Lotus Notes on Windows PC without any data loss. It is an efficient, reliable and user-friendly technology that can be used by any business or home user. There are multiple options available for keeping certain items, folder or emails from export. It will make for a smoother transaction during PST to NSF migration. The only necessity is that both Outlook and IBM Notes to be installed with admin credentials. A default .nsf template is provided for reference. Also, Lotus Notes should not be connected to the Domino server during transfer. A dummy POP3 profile must be configured on Microsoft Outlook for PST to Lotus Notes conversion. The software can export the entire contents of an Outlook data file(.pst) and save it to Notes format. It moves each item stored within it with total accuracy. Each email with attachments, contacts, calendars, tasks and journals are moved using the PST to Lotus Notes Converter. It works on all latest Windows versions 10 and earlier ones. There are no changes made to the data during transfer. Even the item properties like to, cc, bcc, dates, email ID, appointments, attachments are kept intact. The Outlook to Notes migration utility provides 100% accurate results in the output format. A single NSF is created for each PST file loaded to the tool. The program gives a user a lot of options to simplify their conversion. One can choose between mailbox items to export. There is a facility to check/uncheck elements before the transfer and selectively move data. This frees the PST for other tasks like communication and editing. The Outlook to Notes Converter can easily sort out mailbox items based on the date they were received. It can reduce the time taken for complete data transfer. It even enables a user to migrate in batches. This filter can be applied to emails, calendar and tasks by setting a ‘to’ and ‘from’ date. With the Outlook to Lotus Notes converter, one can prevent the trash folder from being moved as well. There may be some emails still left in there which were not removed. It can save a lot of time by excluding the deleted items folder. The software requires mandatory Lotus Notes 9.1 or earlier version installed on the Windows machine. There is a detailed report generated at the end of the PST to NSF migration. It contains details regarding the file name, path and individual item count. There is no change in folder hierarchy in the resultant format. Each email is found exactly in the same manner as in the original Outlook profile. 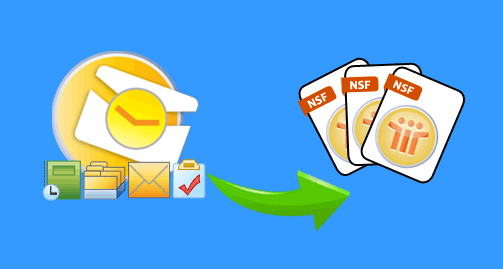 Free Version: The tool allows to convert PST to NSF free 15 items per folder only . It has the option to add a PST file, select between mailbox items, apply filters on emails, tasks, calendars. Full Version: With the complete product, one can export unlimited items from Outlook to Notes. There is no size limitation on the .pst file that can be loaded to the tool. Step 1 : Download and install PST to NSF conversion tool and launch on the machine. Step 2 : Then, Browse to the folder location where the Outlook PST file is saved. Step 3 : Next, apply email, calendar, tasks filters and select destination for PST to NSF migration. Step 4 : Finally, click Export after selecting location where the output NSF file will be saved. Where can PST Files be located on a Windows PC? Yes, they can be found in Control Panel >> Mail >> Data Files. Select the PST and click on ‘Open File Location’ from the mini toolbar to find out where it is saved. What Outlook version is compatible with the Export PST to NSF conversion tool? No, just the Outlook application from any version 2016 and earlier ones are needed. It can be for either 32 or 64-bit computer. What is the size limitation of the PST file that can be uploaded to the PST to Notes Converter? No, the algorithm is powerful enough to work on large PST files of any size. There is no size limitation imposed as such. Why are the Lotus Notes and its components have a ‘cross’ when using the Outlook to Notes Converter? Notes and Outlook are installed. Admin rights are there on the Windows PC. Make sure Lotus Notes is not connected to IBM Domino server. Is the PST to NSF converter work with Lotus Notes version 6.5? Yes, the utility can work on any versions of Notes 6.5 and later even the latest v9.0. "The PST to Notes Converter is a professional application that can come handy when migrating Outlook mailbox. It is very easy-to-use and has simple features that can be used with just click of a few button. There is nothing complicated or confusing to operate this technology. It is designed so that even the non-technical employee can use it."